Bungee jumping options near Chicago are limited. Bungee jumping is an extreme sport where adrenaline junkies can leap from bridges, helicopters or purpose-made towers. There are limited options for bungee jumping in and around Chicago. If you are willing to travel outside the state, there are some jumping options available in neighboring Wisconsin and Indiana, some of which are within an hour's drive from downtown Chicago. In addition to being a skydiving school, Chicagoland Skydiving Center offers bungee jumping. The center is located on Route 30, west of Naperville, Ill. It is approximately an hour from downtown Chicago. Call 815-797-9272 for more information, directions and reservations. Luxergy offers bungee jumping near Chicago, including locations in neighboring states. The company offers a number of extreme sports and adventure packages ranging from scuba diving, car racing, airplane rides to skydiving. Call 1-888-589-3749 or visit luxergy.com for more information. Although further afield, Extreme World is another option for bungee jumping near Chicago. Accommodation is located near the theme park if you wish to stay overnight. The park is located in Wisconsin Dells, Wis, three and a half hours from downtown Chicago. Extreme World does not operate during the winter months. For more information, call 608-254 4111 or visit extremeworld.com. Affordable bungee jumping, including bungee trampolines for children, are often found in fairs, amusement parks and other attractions. These are generally available for a short period of time, so keep informed about upcoming events and fairs in Chicago and the surrounding area. You can also opt to rent your own bungee jumping equipment. As of 2010, Castle Party Rental provides bungee harness equipment rentals for $1,495.00 for four hours and $250 per additional hour. Visit castlepartyrental.com for more information. Bungee jumping is an extreme sport, and although safety precautions are taken, there remains a risk of personal injury or death. 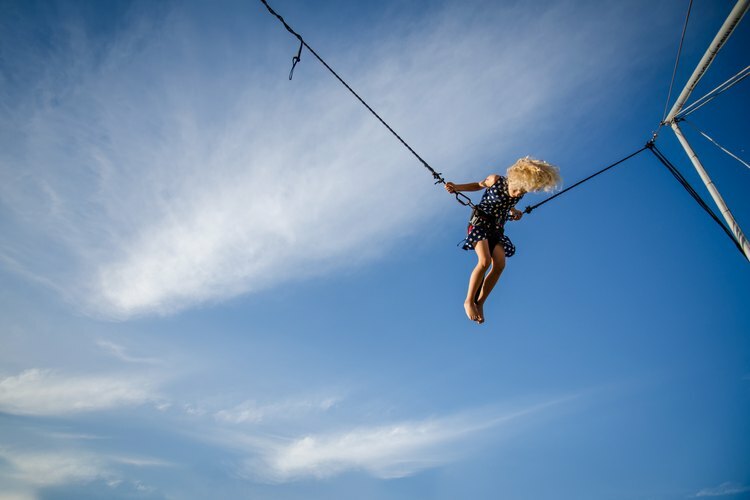 Always follow rules and regulations at the location you are jumping, including age restrictions; bungee jumping is not recommended for children. Consider taking a lesson if you have never bungee jumped. Also, be sure to investigate the safety record of companies and check to see if they are licensed to operate bungee jumping equipment. Do not rent equipment if you are not trained to operate it.